The Golden Gate Bridge, Hollywood and the Big Sur (pictured) are must-see attractions on this 655-mile route. To view the California coastline as you drive along the route, the best way to travel the route is from North to South. If traveling this way, the route starts in San Francisco and goes though Monterey, Santa Maria, Long Beach, Newport Beach and ending in Dana Point. One of the shortest routes, Going-to-the-Sun Road travels 50 miles in Montana. Without stopping, the route takes at least two hours. However, if you do want to stop, picnic areas can be found at Avalanche Creek, Sprague Creek, Rising Sun and Apgar. Points of interest along the route include Glacier National Park and St. Mary Lake (pictured). The route passes the Continental Divide at Logan Pass which is 6,646, feet high. Going-to-the-Sun Road is only passable during summer months. Although the route in Hawaii and Maui County is only 64 miles, it takes around 2.5 hours to drive on the highway that was completed in 1926. The speed limit is 25 mph with good reason since there are more than 600 curves and over 55 bridges . Attractions along the way include the Maui Garden of Eden, Pua’a Ka’a State Park and Wailua Falls (pictured). This 305-mile route has many theories as to how it got the Million Dollar Highway name. Theories include the dirt road used to build the road contains a million dollar’s worth of gold ore, or the approximate cost of construction per mile sum was a million dollars, or because the land the road is on was originally purchased for a million dollars. The route travels through New Mexico and Colorado while Molas Pass (pictured), Red Mountain and Ridgeway State Park are interesting places along the way. Dubbed the Great Northern in memory of the pioneer railroad that parallels half of the route, US 2 travels 2,571 miles and going through 11 states. The route starts in Seattle, Washington going through Idaho, Montana, North Dakota, Minnesota, Wisconsin, Michigan, New York, Vermont, New Hampshire and ending in Maine. Mount Rushmore (pictured), Niagara Falls and Yellowstone National Park are attractions along the route. This highway has been featured in numerous blues songs by dozens are artists including Sunnyland Slim, James "Son" Thomas, "Honeyboy" Edwards and Eddie Burns. The first song about the highway was by Roosevelt Sykes, called Highway 61 and was recorded in 1932. Hopson Plantation, Mississippi’s “Great Wall” and the Grand Ole Opry are some points of interest on the 657-mile route traveling through Louisiana, Mississippi and Tennessee. The “Loneliest Road in America” travels 1,457 miles starting in Wickenburg, Arizona and continues through Nevada, Idaho and Montana. Major cities that US 93 route travels through include Kalispell, Montana, Twin Falls, Idaho and Las Vegas, Nevada. Points of interest on the Border to Border Route 93 are Jasper National Park (pictured), Flathead Indian Reservation and the Hoover Dam. The shortest route on our list, the Tail of the Dragon travels 11 miles in North Carolina. It is considered "the destination" for thousands of sports car and motorcycle fans through the spring, summer and fall. Cherohala Skyway, Moonshiner 28 and the Fugitive Bridge are points of interest along the route. Harrison Ford jumped from what is known as the Fugitive Bridge in the 1993 movie The Fugitive. Deriving from Pioneer’s handmade quilts, this route follows early pioneers who were the settlers of the town of Panguitch, Utah. The pioneers laid the patchwork quilts on the snow allowing the settlers to travel in the winter months. Patchwork Pathway travels only 51 miles in Utah but Dixie National Forest, Cedar Breaks National Monument and Bryce Canyon (pictured) are interesting places along the route. The “49ers" were immigrants who passed through the region looking for gold when they arrived in 1849, thus the name Route 49. Only going through California, the route is 294 miles long. The Empire Mine State Historic Park (pictured), Kennedy Mines and the Angels Camp Museum are places along the route worth stopping for. Right in time for Labor Day—and before the real world calls and you have adult responsibilities knocking at your door instead of that 2 a.m. pizza delivery—it’s time to hit that dream-inducing ribbon of highway. As everyone from Lewis and Clark to Jack Kerouac can tell you, taking a road trip across the US is a life must. While Route 66 was one of the original highways in the US, others have followed with scenic landscapes full of history and culture. 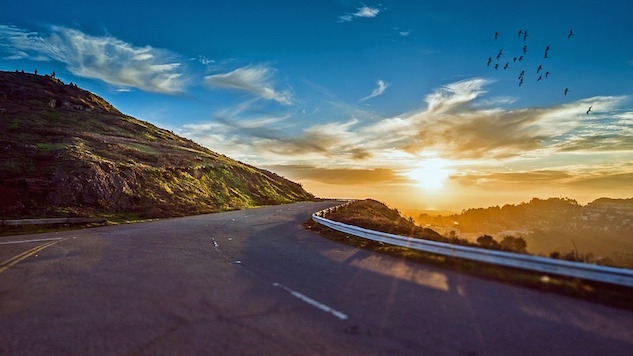 The luggage delivery company, SendMyBag, has delivered the best road trip routes including the Great Northern Route, the Tail of the Dragon and Border to Border Route. Take a break from 66, the Mother Road, and explore these other routes. Drive in the cliché “road trip” convertible, let your hair down and blast those music mixes tunes at full tilt while traveling on one of these all-American beauties.